Now Doctor Who fans can lounge in this amazing Tardis fleece onesie lounger. The Doctor Who onesie is great as a sleepwear, loungewear, and as a cosplay and Halloween costume. The Tardis onesie is made from fleece and is Tardis blue and all soft and cuddly. On the blue onesie you can see the front door windows and sign from the Tardis and then on one sleeve it says “Doctor Who”. You can get this Doctor Who hooded lounger in sizes Small – 3XL and it will look great on both men, and women. So now you can be warm and comfy when watching the latest Doctor Who episodes at home. Now there are materializing Tardis pajama pants. The Doctor Who pajama pants are made from 100% cotton and come in many men’s sizes but it will look great on the ladies too. The lounge pants are navy blue in color and on the left pants leg it shows a materializing Tardis something we all dream that happens in our life. Now you can nap in your Doctor Who pants or just lounge around the house on your day off and yes just sleeping at night will be cool to but keep one eye open just in case the Tardis materializing in your room. 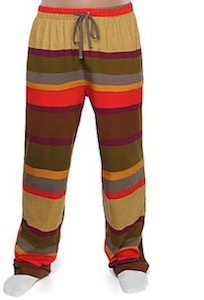 Now you can lounge and sleep in style by wearing these 4th Doctor pajama pants. These cool lounge pants look like the scarf the Doctor would wear so now he does not need a scarf anymore because he and you can just wear these fun pants. The 100% cotton Doctor Who pajama pants come in sizes Small – XL and would work just perfect for both men and women. Now any Doctor Who fan and just be comfy in the evening while rewatching Doctor Who episodes or wears them to bed so that dreaming about the Doctor’s adventures becomes so much easier. 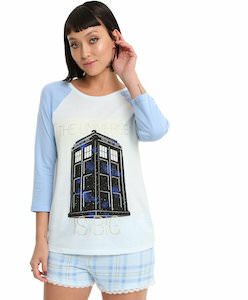 If you like to sleep and dream about Doctor Who then check out this Tardis the universe pajama set. The women’s sleepwear includes shorts and a shirt and is in white and light blue. The shorts have a checkered pattern and lace on the bottom and the top has 3/4 raglan sleeve that are light blue and the body is white with on the front the Tardis in a dark blue galaxy print and above it the text “The Universe”. A fun sleep set like this is great for sleeping, lounging and just having fun and you can get it in women’s junior sizes XSmall – 2XL and will look great on you. This Tardis pajama set is made for men that like the Tardis but women can enjoy wearing it too. The Pajama set has blue pants with on it the Tardis and some fun text that makes you wonder about Doctor Who. And then the pajama top that is a short sleeve shirt that is blue on the bottom part and white above it and on the white you can see the Tardis traveling through time and space and you can see the ripples in the timeline as it travels. You can get this special Doctor Who sleep set in many sizes so that you can have the perfect fit for a good night sleep or lounging on the couch. Now you can dress you baby in a sleepsuit that prepares it to become the next Doctor Who. On this white pajama you can see the Tardis on the front and below it the text “Future Time Lord” and besides that there are just some blue details all over the sleepsuit. This baby pajama is made from 100% cotton and comes in sizes 0 – 24 months and is footless so that you little babies feet can be out and look cute. 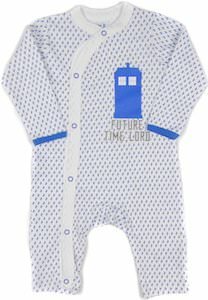 So show the universe who will be the next Doctor Who by dressing you baby in this cute and comfy sleepsuit. Now there is this Doctor Who 100% cotton pajama set that warns us about blinking as it is a Weeping Angel pajama. The pajama has a t-shirt top with on it a Weeping Angel and the text “Don’t turn your back Don’t look away” and then there are the pajama pants that have a Weeping Angel on one leg and the text “Don’t Blink” on the other. The whole Doctor Who pajama set is great looking and because we are not all building the same they sell the set with the size of top and pants you need so you can be can have a small shirt and 2XL pants if that is your size. Now Doctor Who fans can sleep in Tardis pajama pants or just lounge around in them at home. These men’s pajama pants are blue and show the galaxy that the Doctor Who uses to travel trough and in that galaxy, you can see the Tardis just flying around many times. Made from 100% cotton these Tardis lounge pants are available in men’s sizes XSmall – 2XL and sure they may be made for men but that should not stop the ladies from looking amazing in these Doctor Who pajama pants. Time for dreams about the Doctor and his adventures thanks to these police box and the outer space pajama pants. 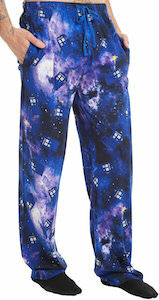 Now there are Doctor Who lounge pants that are great for lounging around or sleeping as they work as pajama pants too. The pants have square on them and some of them say “Doctor Who” in them while others say “Dalek” and then there are squares that just have the Tardis in them. and all those squares make for a fun colorful design. You can get these Doctor Who pajama pants in men’s sizes Small – 2XL and sure women can wear them too as they are just perfect and comfy.